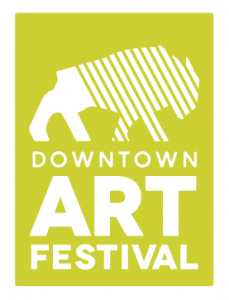 The 4th Annual Downtown Art Festival brought to you by Alpine Bank with support from Renewal by Anderson kicks off on October 4th during First Friday. Visit Downtown galleries and local businesses to see local talent displayed in various forms of artwork while enjoying Union of None, a local band set to perform at the Buffalo (4th and Main) from 5pm-8:30pm. The festival continues on October 5th, where Main Street (from 2nd to 7th) will be filled with local artists, local vendors, and live demonstrations and performances. Watch the installation of the 2019-2020 Grand Junction Art on the Corner temporary exhibit early on Saturday morning, Oct. 5th and stick around to chat with the artists about their piece. Then continue to enjoy the festival as you wander through shops and galleries and enjoy food trucks, entertainment, and the Mesa County Libraries Comic Con March, happening at 5pm on Main! The 2019 Call for Artists will open soon. Please check back soon to apply!